Got your own site? Show it off here! 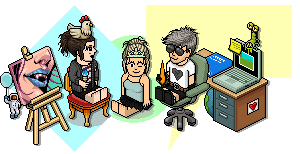 Including new Habbo fansites! A place to sell and buy scripts, layouts and anything else related to the web. Sticky: What phone do you have? Virtual Reality & Job Interviews?! Whats the most used app on your phone? How organised are your bookmarks? Bitcoin - making sure you do your own research! Have you heard of the app Sweatcoin? Anyone know of any new fansites?